(Algonquin mythology) Wendigo/Windigo, are the demons of the woods from the regions of Canada and the United States originating in Algonquian folklore. The Wendigo hunts humans and eats the flesh of his victims. This mythical man-eating monster takes the form of either a beast with some human characteristics or as a human who has become possessed by the evil Wendigo spirit becoming the embodiment of a monstrous cannibalistic being. Psychiatrists diagnose these symptoms of immense greed and uncontrollable cannibalistic tenancies as Wendigo psychosis. Although many cases can be caused by an ill mind, a few may be considered true cases of Wendigo involvement. The Wendigo is an evil, cannibalistic, supernatural being as believed by some Algonquin-speaking peoples, including the Ojibwe, the Saulteaux, the Cree, the Naskapi, and the Innu people. The Wendigo was gaunt to the point of emaciation, its desiccated skin pulled tightly over its bones. With its bones pushing out against its skin, its complexion the ash gray of death, and its eyes pushed back deep into their sockets, the Wendigo looked like a gaunt skeleton recently disinterred from the grave. What lips it had were tattered and bloody [....] Unclean and suffering from suppurations of the flesh, the Wendigo gave off a strange and eerie odor of decay and decomposition, of death and corruption. 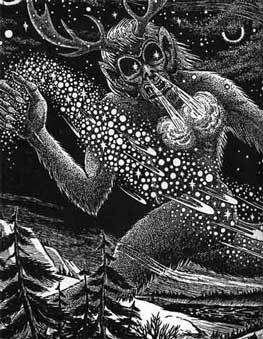 The Ojibwe, Eastern Cree, Westmain Swampy Cree, Naskapi, and Innu lore add an additional trait to the Wendigo beast not present in other beliefs; the Wendingos are described as giants that are many times larger than humans. They believed that when a Wendigo ate another person, they would grow in proportion to whatever they had consumed. Constantly growing caused the Wendigo never to be full because they were always hungry as they grew. That is why the Wendigo is described as being simultaneously gluttonous and extremely thin due to starvation. It is believed that humans can become Wendigos by excessive greed or by being around Wendigos for far too long. A Plains Cree trapper from Alberta, named Swift Runner is one of the most famous cases of Wendigo psychosis reported. In the winter of 1878, Swift Runner and his family were trapped 25 miles away from emergency supplies. Swift Runner"s eldest son died under these circumstances. Swift Runner survived by butchering and eating his wife and five remaining children. Swift Runner was confirmed as a case of Wendigo Psychosis because although it was 25 miles, he killed and consumed all present even though 25 miles from the nearest emergency supply was not extremely far. Swift Runner confessed and was executed by authorities at Fort Saskatchewan. TV series Supernatural Season 1 Episode 2 "Wendigo" featured the Wendigo myth as Sam and Dean deal with this monster. Ravenous (1999), is a popular horror movie where a group of soldiers takes a dark turn and fall victim to a cannibal at a remote outpost. The Wendigo demon is a male demon.